Unfortunately, anyone can get German Roaches. These little roaches are like bombs waiting to go off. ONE little roach can hitch a ride on anything, and get brought into your home or business. 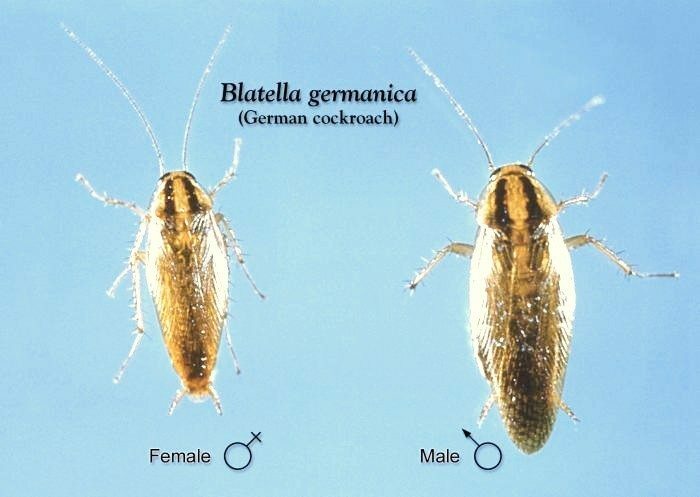 German Roaches commonly infest cardboard box packaging, and shipped goods. German Cockroaches can also crawl right onto you, in an infested home or restaurant, and be brought home with you. German Cockroaches reproduce QUICKLY, almost like an explosion!! Every female German Roach can produce 5-8 egg sacks with 30-40 eggs inside. German Roach eggs can HATCH in ONLY 50-60 days! Unfortunately for us Arizonans, roaches do best in WARM and a bit humid conditions. SCARY, but true. Because roaches are active at night, spotting one of these little nightmares during the day is a sign of a much bigger problem! Responsible Pest Control specializes in German Roach Control throughout the Phoenix AZ Valley. Call for your free estimate. GUARANTEED Termite & Pest Control for 22+ years. Mesa Pest Control in Phoenix, Glendale, Chandler, Mesa, Gilbert, Scottsdale, Peoria, Queen Creek, Maricopa, & surrounding areas. Filed Under: Chandler Pest Control, Exterminator, Gilbert Pest Control, Maricopa Pest Control, Mesa Pest Control, Pest Control Buckeye, Pest Control Gilbert, Pest Control Glendale AZ, Pest Control Mesa, Pest Control Phoenix AZ, Pests in Arizona, Queen Creek Pest Control, Roach Control, San Tan Valley Pest Control, Scottsdale Pest Control Tagged With: How Do You Get German Roaches?